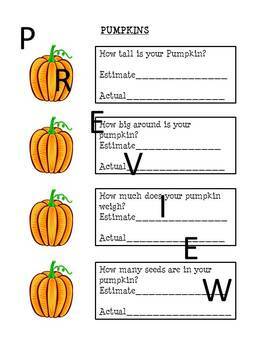 Students estimate and work cooperatively to solve actual pumpkin measurements involving height, circumference, weight, and how many seeds. Students work in small groups of 4-5 students with 1 adult per group. When finished with measurement, students can design and carve an original jack-o-lantern with the help of the adults/parents. I also cook up some pumpkin seeds for a tasty snack.